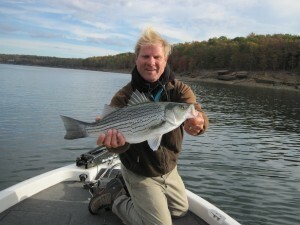 Bo and his good friend, Chuck Farneth, had a blast “Hybrid Trick-or-Treating” on Greers Ferry Lake today. The Hybrids were in full blitz mode on the Threadfin Shad. This is absolutely stalk hunting for big, strong fish on dry flys on 8 wt. fly rods. The boys spent the day cruising the lake and glassing for crashing fish and watching the birds chase the shad. When the “blitz’ starts the fun is on!! 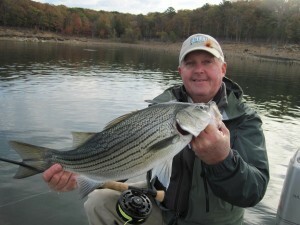 This is prime time for Hybrids and Greers Ferry Lake is in all it’s beautiful fall colors. Don’t miss out on the Hybrid blitz and book a trip with Empty Creel Fly Fishing Guides and Outfitter.